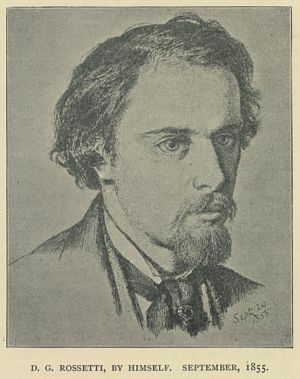 Rossetti was one of those unique, brilliant men who stand out amongst their contemporaries and remain fascinating figures for future generations. It is true that his deep, searching, sometimes tormented poetry may no longer be considered of such interest, but his art still draws us with its colour, sensuality and mythical themes. A home is a reflection of its occupants. And it is interesting to see how homes change or are altered along with the character of the occupants, each new inhabitant putting their personal stamp upon them. To my mind, a house, or anywhere we consider as home, becomes a reflection of our feelings and physical bodies, the symbolic place the soul inhabits. Often when a building becomes neglected and starts to need repair, a person’s health also suffers as if the house is an outer shell to the human bodies within it. Jung might have considered this as synchronicity but I have observed a definite relationship with bodies and surroundings and the places that draw us to them or the type of house we may want to live in but which life and fortunes deny us. We still dream. I always yearned for a villa in Italy but that’s not going to happen in this lifetime! It isn’t because I couldn’t do so but I choose to stay in a country with which I am now familiar, near family and the English countryside I love. On the whole, woman was and still is largely the home maker and a house reflects much of her taste. It’s always interesting to see how single men furnish or neglect their home! Their taste is generally more sparse and utilitarian but perhaps things are changing as men and women share the task of homemaking far more. Gabriel Rossetti did share his first real home with his eventual wife, Lizzie Siddal, but after her death remained a widower till he died. In his case, both of his important homes tended to reflect his own dominant, energetic, eclectic personality far more than a shared one. And it was by no means a utilitarian or sparse taste. It befitted such an artistic, flamboyant nature with a love of unusual and beautiful objects to delight the eye. Rossetti moved around London at first, renting studios. He and his fellow Pre-Raphaelites, Hunt, Stevens and Collinson chanced upon a beautiful old house along the riverside at Chelsea. It was said to be built on the site of a mansion used by Queen Catherine Parr, Henry the Eighth’s last wife, and named Queen’s House or Tudor House. It had a many bedrooms, sitting rooms, drawing rooms and a kitchen and cellars. The young artists easily envisaged having a studio each. But the rent and the long lease were more than they could afford and they regretfully gave up the idea, going for separate studios instead. 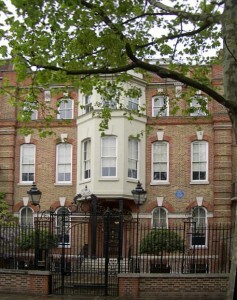 Gabriel took a room in Newman St. over the top of a dancing academy and continued to live at his parental home. This was followed by a studio in the garden of a house called The Hermitage on Highgate’s West Hill. During this time, Gabriel was painting and falling deeply in love with his red-haired muse, Lizzie Siddal. His fascination with the great Dante Alighieri, his namesake, led him to see Lizzie as his own Beatrice. He often painted her as such in his varied pictures with Dantesque themes. However, it was a complicated relationship due as much to the fact that their social standing was very different and so marriage seemed unlikely in those class-ridden times. They were said to be engaged but it was nothing definite or declared publicly. For various reasons, of which Lizzie was one, Gabriel needed a new ‘crib’. He and his brother, William, (who purportedly shared it and paid half the rent) eventually found rooms on the second floor of a house in Chatham Place, very close to Blackfriars Bridge and over the confluence of the Fleet and the Thames. The buildings no longer exist sadly, part now of Blackfriars Station. There were two rooms; one was to be the studio, the other a small bedroom with a balcony overlooking the river from whence arose the stench of sewage, meat thrown in from Smithfield’s and other unpleasant odours. 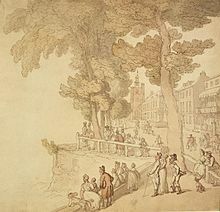 Londoners were used to the foulness of their river. It was a busy river in those days and no doubt interesting. It had its charms according to Gabriel’s visitors. The rooms had windows on all sides and virtually hung out over the river, which made it light and cheerful. As always, Gabriel begged and borrowed furnishing from home, particularly mirrors which he considered essential for his studio. He was always fond of mirrors. 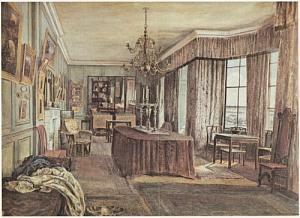 This, his first home, so to speak, reflected the young Rossetti. It was cheerful, bright, adequate to his simple needs and his beloved Lizzie lived just a short distance away in the Old Kent Rd. A convenient place therefore for her to model as well as remain and dine with him, allowing them to enjoy each other’s company without interference. George Boyce, an artist friend, wrote that it was a picturesque place, especially at night with the gas lamps on the bridge and wharf side shedding their wavering reflections on the river. Here was enjoyed the intelligent, good-hearted company of gentlemen who could speak freely without need for coarseness or fear of public mores and opinions. The whole ethos of the Pre-Raphaelite Brotherhood . . . and they did indeed feel like brothers at first . . . was that it was to be about truth, freshness, no pretentious nonsense, secrecy or chiaroscuro. It seems that these were Gabriel’s happiest days; deeply in love yet uncommitted, his greatness rising and manifesting itself in his poetic and artistic works with more beautiful work still to come. Poetry in his heart and soul. Simplicity was the order of the day then. He disliked ‘tobacco, tea, coffee, stimulants’, drank water, allowing others in his usual easy going and uncritical manner to imbibe what they would. How different he became in later life when disappointment, tragedy and depression overcame that sweet, pure young soul. 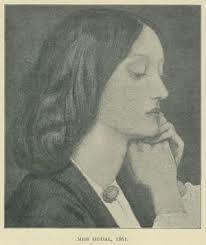 Rossetti at last committed himself to marriage with Lizzie in 1860. 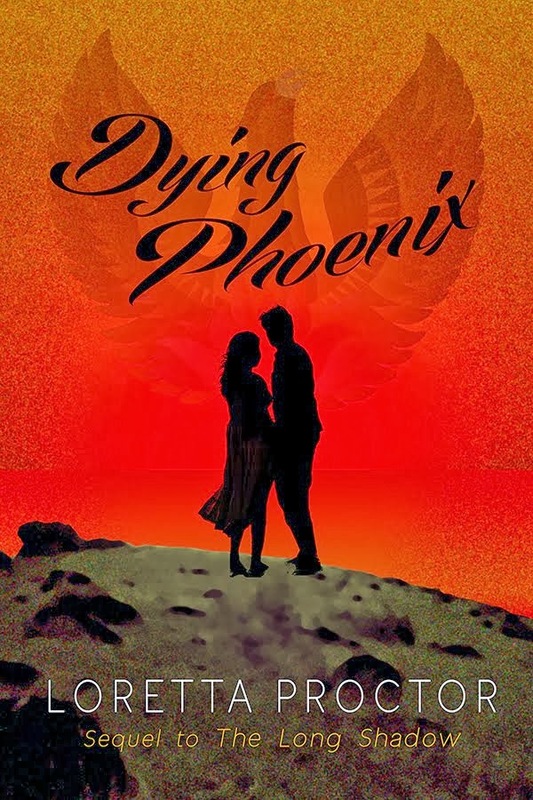 They had been together for so many years that love had altered to companionship and mutual understanding but the fires of passion had long gone. By this time Lizzie, always a sensitive, refined woman had become sickly, perhaps a little hypochondriac, unhappy and sad, reliant on laudanum to ease her pains of mind and body, feeling that Rossetti was now replacing her with younger models and perhaps in love with them. But his love for her was real and constant in its way even though, as with all long-term relationships, well past the ‘first fine careless rapture’. He had at one point broken off their engagement but knowing she was very ill, married her as much from pity as anything else. Sadly, in 1861 she lost her eagerly desired first child, a stillborn girl, becoming pregnant again almost immediately that year. Whether she suffered from postnatal depression, or was heart broken because she felt that Rossetti’s love was slipping away and thus committed suicide, we shall never really know. Ford Madox Brown destroyed the note she left and the verdict was recorded as an accidental overdose. By 1869, Gabriel had changed greatly. He was now addicted to drugs and alcohol . . . this the young man once desirous of being clear-headed and inwardly pure! From a slender, handsome young man he was now corpulent, said to eat enormous amounts of food where once he had lived simply and lightly. 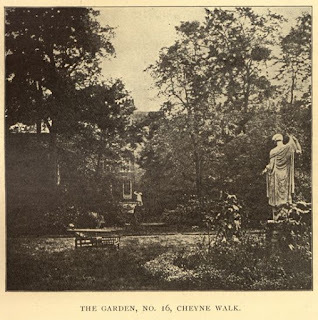 After Lizzie’s death, Rossetti was able to achieve his earlier dream of renting the house in Cheyne Walk in Chelsea, the large, rambling place called Tudor House. Thus, his new home was now enlarged like himself! 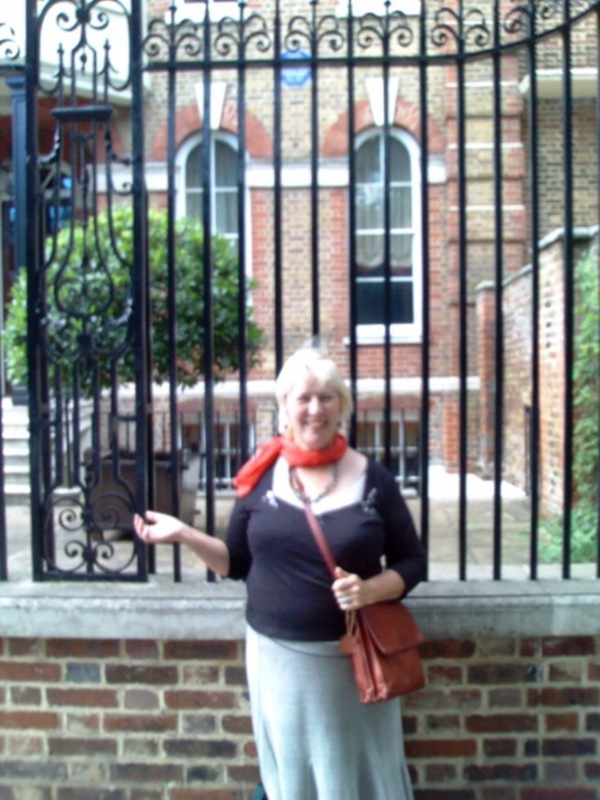 It was a quiet, out of town location along the Thames close to the Chelsea Physic Garden and the Royal Hospital. Now as the centre of the bustling London Metropolis, it is hard to imagine that it was once such a quiet peaceful backwater with moorings, landing places and boats and barges sailing past. There was no embankment built at that time and occasionally the tides would flow over from the river and flood his cellars. The house itself is still there and very imposing, with its elegant courtyard and well-proportioned windows and doorways. 16 Cheyne Walk. You can just see the blue plaque behind me. At first, Rossetti hoped to be able to bring all the women of his family together in the large house to take care of the place and himself. Marriage held no attractions for him. One doubts if it ever did and if his release from the invalid, Lizzie, was not a relief deep down in his heart, much as he grieved her loss and grieved for old memories of passionate love. However, grief or not, within a very short while, he installed Fanny Cornforth, his golden haired model of many years, purportedly as the housekeeper. Fanny, who did love Rossetti, had by now left her husband whom she had married in a sort of pique when Rossetti married Lizzie. 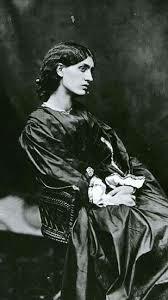 She was followed by Swinburne the poet, Meredith the novelist and William Rossetti who also now occupied the large house. 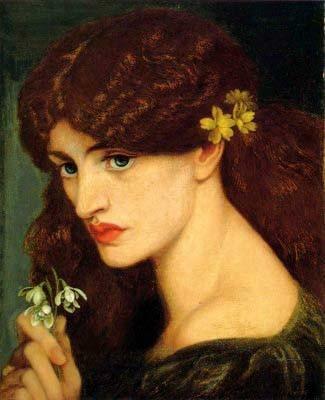 Rossetti was an individualist and a loner, yet like many such loners, he did not want his own company for too long. He needed people around him, needed recognition while at the same time spurning it. A complex character. The whole idea of the Pre Raphaelite Brotherhood was founded on the idea of non-conformity to the given artistic values of his day. Rossetti steadfastly refused to enter his pictures in the Royal Academy and exhibited them privately if at all. Yet as he grew older, hopes of nomination did arise. Thus do we all change our tunes as we grow older and become the very thing we once despised! Tudor house began to take shape in the style of Rossetti. The large, spacious, beautiful rooms slowly filled with amazing and unusual items picked up from curiosity shops, a mix of high quality articles and junk. Many of the items were used in his pictures as background; furnishings, materials, peacock feathers, pieces of jewellery. None of the decorative jewellery was of any real value, his favourite being the pearl pin, which features in many portraits. Sadly, this has not survived though other items did. While away with his brother William in Antwerp, the two men enjoyed themselves scouring old shops for brooches, ‘a large jar with blue birds’ old prints and varied items. 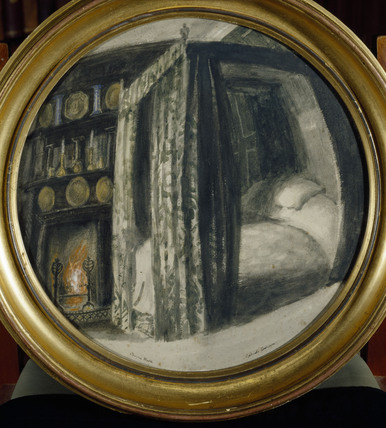 When a fried, Henry Munby, dined with Rossetti he was amazed and fascinated by the wonderful drawing room filled with so many objects, curios, mirrors on ever wall, pictures and Italian cabinets, Dutch blue tiles on the fireplaces. He walked up and down the room, examining everything with delight absorbing ‘the aroma of its manifold romance’. On another occasion, an evening this time, he found the room bathed in the glow of the firelight with huge Elizabethan candlesticks gleaming on ebony furnishings, silver gilt dishes and flagons, creating a delightful ambience of poetry and beauty. 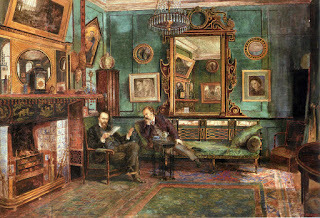 Rossetti lived out his inner romance through his house and his unique style of furnishing. The intriguing and eclectic mix also reflected Rossetti’s own interests and the breadth of his conversation which all those who loved and knew him acknowledged to be erudite and filled with arcane as well as modern knowledge. Rossetti's bedroom reflected in a mirror by H T Dunn. 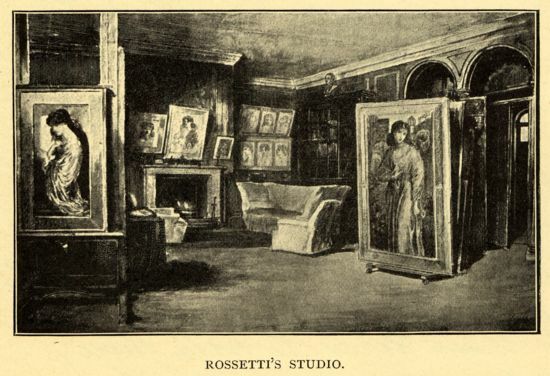 The strangest room in the house was Rossetti’s bedroom, which was particularly dark and heavy. In it he installed a dark black mantelpiece that rose to the ceiling. The thickly curtained windows, the heavy hangings around the dark oak four-poster bed reflected Gabriel’s inner state. While the rest of the house glowed with colours, imagination, brilliant objects as did his portraits, here were the dark, depressed thoughts with which Gabriel lay down to his slumbers and to which he awoke. 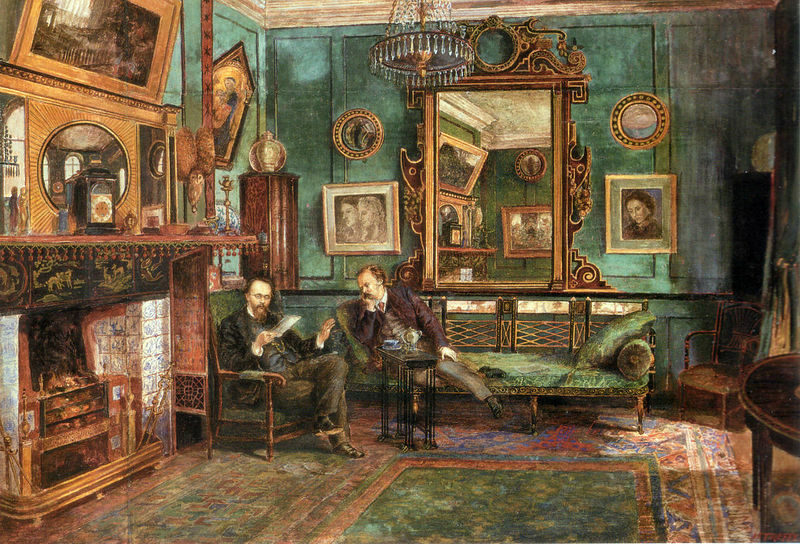 Rossetti now turned to becoming an avid collector. One of Rossetti’s most obsessive and passionately acquired collections was for blue porcelain. When living with Lizzie, he had begun with standard willow pattern pieces. (Intriguingly, the willow pattern design appears to have originated in England based on a tragic Chinese love story and then adapted by the Chinese for their designs.) Then Gabriel began to collect beautiful pieces of ware from Nanking. This particular porcelain, painted with greater precision and detail and with finer glazes, was considered superior to the Canton china. China produced a great deal of the blue and white ware in the 18/19th century when it became highly popular both in the States and in Europe. The exquisite blue colour was derived from Persian Cobalt, exported to China and used to make bowls, ginger jars, vases, plates and so on. The craze for this blue found its way to Europe, where it took hold in Parisian circles. One can imagine how it might appeal to the artistic society: something about this colour draws us to it all the time, spiritual, sky, heaven, purity, calm and peaceful. Certainly, something needed in the rather zany household of Rossetti and his friends. His great rival in collecting was the artist Whistler who lived close by. They tried to outdo one another by buying up choice pieces from antique shops, the Oriental warehouse in Regent Street and abroad. ‘My pots now baffle description altogether. Come and see them!’ said the exultant Rossetti to his friend Ford Madox Brown. Whistler was said to eat his heart out with envy if Gabriel secured a particularly splendid piece. And no doubt vice-versa as well! His other famous collection was of varied animals, which he kept in his garden. The garden flourished in a wild state, left as Nature intended for the ‘survival of the fittest.’ In it roamed peacocks, whose irritating noise kept neighbours awake and indeed resulted in Lord Cadogan inserting a clause into the lease of Tudor House forbidding that these birds be kept in the garden. Other inmates of this scatterbrained zoo were a deerhound, a barn owl, rabbits, dormice, hedgehogs, wombats of which Gabriel was particularly fond, lizards, salamanders, parrots armadillos and a kangaroo. A fierce zebu (an Indian bull) was also brought in which turned out to be so ungovernable, chasing Gabriel into the house and almost uprooting the tree to which it had been tethered, that it was promptly resold. The animals were mainly kept in specially built cages but unfortunately, Rossetti was as ignorantly neglectful of these myriad pets as he was of the women in his life. Many ate one another, burrowed their way out of the garden or simply died from lack of adequate nutrition and care. One of the armadillos was said to have turned up in a neighbour’s kitchen much to the horror of the cook. There was even talk of buying a lion, gorilla or an elephant. Not a garden for the dainty to enter! Thankfully this didn’t happen. Gabriel’s studio also reflected his desire to collect. He collected feminine beauty in the form of first Lizzie, his Beatrice, then later with his compulsive longing to possess Jane, the wife of his friend William Morris. He could not quite do so (though it is generally assumed they were lovers (perhaps not physically however) but he possessed her as his muse and model’ Her image looked out on all sides of his studio, the place where he could indeed possess his loved ladies, stacked against the walls, sketches and drawings, paintings and photographs. Rossetti was searching all his life for this inner muse, his anima figure and felt that she eluded him, as do all writers, musicians and artists for we can never really capture this inner being in flesh and blood. Both Lizzie and Jane became beauties in his portraits though neither was especially handsome and even slightly masculine in their looks. Dark haired Jane seemed to reflect the Italian genes far more. Gabriel did move into Kelmscott with Jane and William later in life but it was never his home as such, rather reflected the taste of Jane and William and their family. He kept the tenancy of Tudor House till he died. By then the animals were long gone, the garden totally overgrown and Rossetti a complete wreck. Fanny Cornforth remained faithful to him all his life but she was never a great love of his, rather a person with whom he could relax, feel comfortable and cared for knowing she truly loved him. It is always good to feel loved. However, the mores of the times prevailed and Fanny was not considered a suitable person to attend his funeral and kept away. 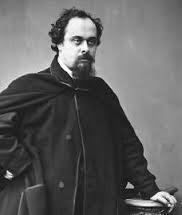 In April, 1882, Rossetti died on Easter Day, aged 54, at Birchington-on-Sea, Kent, his last and temporary home. Dante Gabriel Rossetti Painter and Poet by Jan Morris Weidenfield and Nicholson, London. To my mind one of the best accounts of his life. This was interesting and informative. I've always found his "image" enigmatic, and have liked some of his poetry, but had no idea what a sad course his life took. I've read some of his liter's poems, too (Christina), and they seem quite sad. That was sister's poems, not liter's poems. Aargh. So intriguing Lorri! I remember reading some of this when I was researching. It made me sigh for all those scenes I cut. The Nanking china, Lizzie, the zoo. Anyway, thanks for this fascinating look into a favorite artist! Yes, Christina's poems are sad, Elizabeth, but then she was a very unhappy person, very religious to the point of giving up her fisncee over her principles. Too straight laced.